Only 48 miles apart, less than 50 minutes if you really step on it, are two towns linked by paint and peanuts. It could be called the “fumes and legumes” tour, although by the time you read this, the paint has long-since dried. Visiting one place without visiting the other would be a crime (a misdemeanor in Alabama but a felony in Georgia). Besides, if you find yourself in either SW Georgia or SE Alabama, there’s usually not a lot going on, so why not take the time to watch the paint dry. I know it sounds dull, but it’s the way they applied the paint that makes it so interesting. 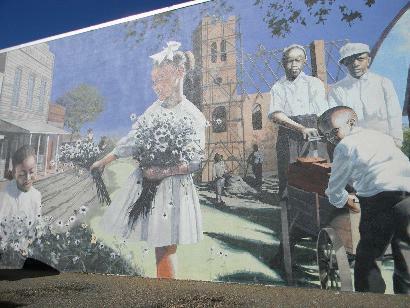 Tiny Colquitt (population under 2,000) has been declared First Mural City by the Georgia Legislature, while Dothan, Alabama (population over 65,000) has long been known as The “Peanut Capital of the World.” It’s a sore point for Georgia, so don’t bring it up in Colquitt. 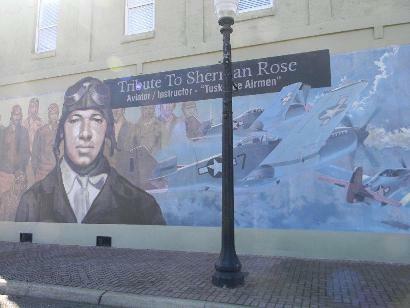 It’s just a matter of time before the Dothan murals get mentioned in the form of an official or semi-official slogan. 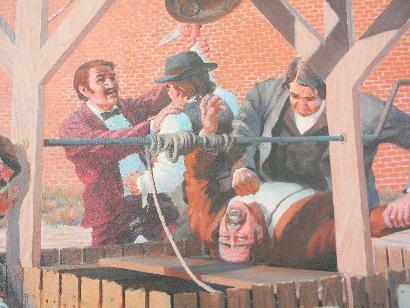 They have a committee working on it. Since I have no idea where you live, you’ll have to supply your own starting point, but since there are only two stops on this “tour,” just get to the first place and drive to the next. Either way, you’ll be dazzled by the art – most of it commissioned by professionals. 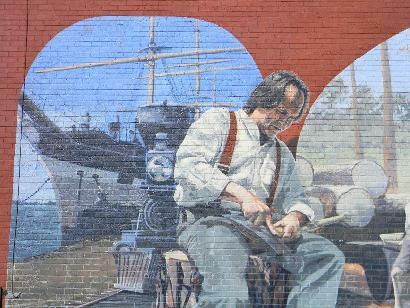 You will see many of the artist’s names repeated in both towns and some are even married to one another. 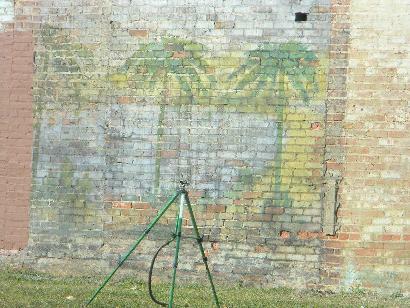 It’s hard to stand in downtown Dothan without getting the feeling you’re being watched. And don’t blame it on security cameras, either. 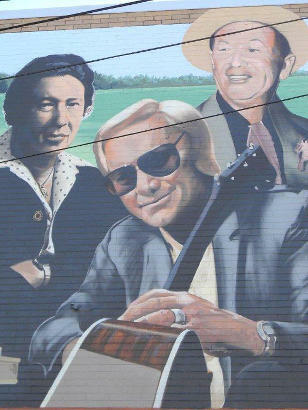 It’s “them,” Aviators, musicians, soldiers, farmers, and at least one celluloid cowboy watch over you – or glare, depending on how paranoid you are. G.W. 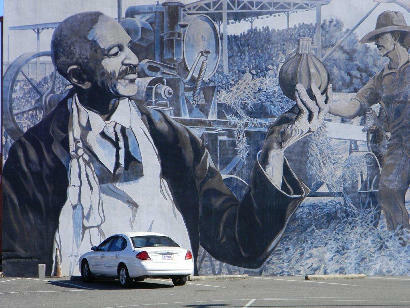 Carver, The "Peanut Wizard"
Observe at your own risk! 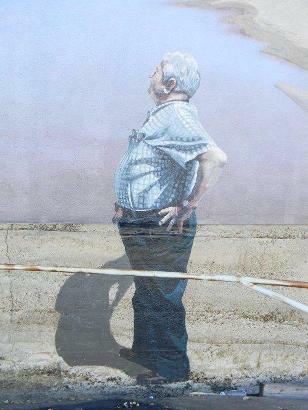 One man (and his shadow) got too close to a mural and became part of it. 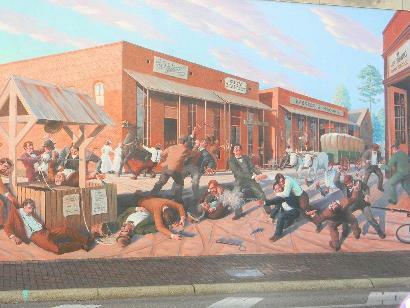 "Not on the official tour, but..."
After enjoying the Dothan murals, proceed to Colquitt, Georgia. Your GPS should know the way.